The Briard or Chien Berger de Brie hales from eighth century France where it is often seen documented in tapestries with the Emperor Charlemagne. At the time, it was a working herding dog keeping flocks of sheep within unfenced pastures as well as guarding its masters’ property. The Briard’s most famous work however was as the official dog of the French army, where it served in both world wars as a sentry dog carrying supplies and messages to the front lines as well as helping to locate wounded soldiers and detect mines. In addition to Emperor Charlemagne it is also believed that Napolean owned this majestic breed. In 1863, Pierre Megnin identified and documented two types of sheepdogs. Those with a long coat became known as the Briard and those with short coats were Beaucerons. Soon the Briard was cross-bred with the Barbet to improve the dog’s look. Both Briards and Beaucerons quickly earned a reputation of being quick to snap and bite as they herded sheep. This temperament flaw was eventually softened through selective breeding. By 1897, the first standards for the Briard were developed and in 1909 Les Amis de Briard, a French Briard club was created. This club refined the breed standard which was later adopted by the Briard Club of America formed in 1928. While not well documented it is thought that Thomas Jefferson, impressed by the breed’s herding abilities, first brought the Briard to America in 1789 and wrote, “they are the finest house and farm dogs I have ever seen.” Some believe however, that Marquis de Lafayette brought the first Briard to the United States. In either case, in 1922 the first litter of Briards was registered with the AKC by Barbara Danielson of Groton, Massachusetts and by 1928 the AKC officially recognized the breed as being part of the Herding Group. To this day the Briard remains very popular in France though is still fairly uncommon in the United States. The Briard is a large, powerful, energetic herding dog with a distinctive appearance. Its adorable head includes a wide muzzle framed by a long mustache and beard, large eyes encircled by dark pigmentation around the rims, and highly set ears, either cropped or natural. This dog also has a uniquely cropped tail with a “J” shaped hook at the end known as a crochet. Another unique feature of the Briard is its double coat. The outer coat is coarse and dry similar to a goat’s coat. It falls naturally in long wavy locks. Due to its coarse nature dirt and water do not easily cling to the coat and shedding is minimal with regular grooming. Coat Color: All shades but white. A tawny color is most common. These dogs have sometimes been mistaken for a haystack in the field. Grooming Needs: Long, up to 6 inches in length requiring regular brushing and grooming, up to two hours weekly. The sweet but dominant Briard is playful and obedient with a sensitive and protective nature. Due to its herding and working dog traits the intelligent Briard can have a mind of its own and may not be ideal for every home. It is often shy around strangers though not at all timid and in fact is very brave. Once described by a French actress who owned the breed as, “a heart wrapped in fur,” the Briard is a loyal and unselfish member of the family. In fact this dog sees its family as its flock worthy of herding and protecting at any cost. It is often disinterested and potentially aggressive with people outside of the family unit, especially those that the dog perceives as a threat to the “flock”. The Briard does best in the home when its owner provides extra love and attention to bring the breed’s heart warming character to the forefront. As mentioned, this breed is intelligent and a natural leader in the field herding sheep. 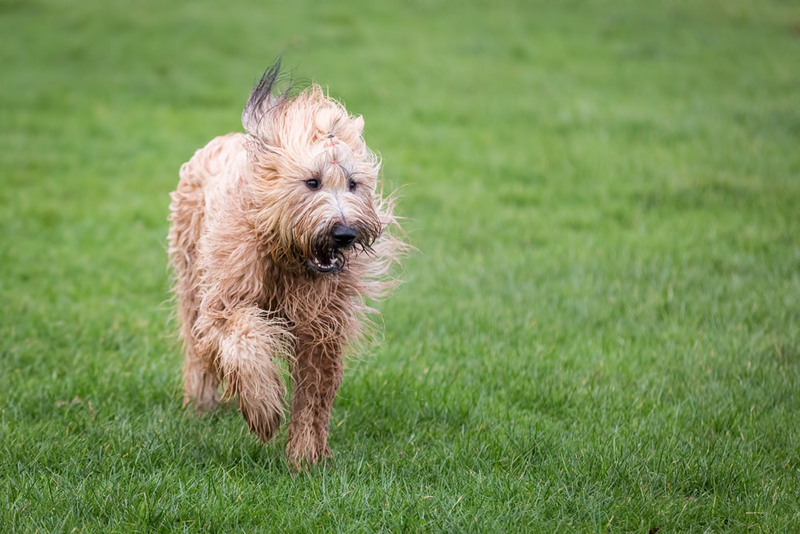 These instincts sometimes manifest around people when the Briard may attempt to herd humans by nipping at their heels or bumping into the backs of their legs. Additionally, due to its protective nature, the Briard (more so males) will be aggressive towards other dogs or people if it senses that its owner needs to be protected. As such, a successful Briard owner must assert his/her role as the leader training the dog with kind but firm techniques. If the sensitive Briard senses weakness in its owner’s authority role (it is a superb reader of body language and vocal tonality) it can become stubborn, fearful and unfriendly. Good with children? The good natured Briard loves children and has been known to occasionally protect them from parental spankings. Good with other dogs? The Briard can be dog-aggressive if its owner isn’t a strong alpha leader. Early socialization is mandatory. Good with cats? Some Briards are not good with cats, but those who are raised with them from an early age and taught appropriate behavior generally do fine. Good watch dog? Yes, it has exceptional hearing, making it a wonderfully alert watchdog. Easy to train? The Briard is very trainable, eager to learn and please as long as its owner establishes his/her role of confident leader. Training should be consistent with lots of patience and praise. As with most breeds, training should begin at a young age. Can be left alone? It is best not to leave this dog alone for longer than a few hours due to its ongoing concern for its flock, which it will perceive as missing when left alone. Briard’s are happiest when they are inside with their family. Barker? Generally no, however, it will use its loud deep bark to call attention to people walking by or if it senses any sort of danger. Activity level? Due to its working and herding abilities, the Briard is happy outdoors with its family and could develop behavioral problems if not exercised daily such as with long walks or runs. An average sized fenced yard is ideal though the Briard can live in an apartment setting as long as it gets sufficient exercise.